A strong contributor in the athletic arena, Dorothy Finley has dedicated much of her life actively improving the quality of sports in Pima County. Her allegiance to sports began in high school where she played softball, basketball, and soccer. She continued this fellowship at the University of Arizona where she received a varsity letter “A” in General Sports. 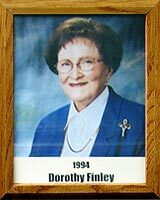 A native Arizonan, Dorothy, the president and CEO of Finley Distributing Company, has been a successful part of the Miller Brewing Company since 1948. From non-profit groups to professional societies, she serves on the board of over fifty community associations. She was instrumental in organizing an advisory committee in support if the UA Department of Exercise and Sports Science and in bringing about the Quaker Oats donation which secured funds for the scoreboard at Sancet Field. Dorothy has been recognized for her financial contributions in building the John (Button) Salmon statue and mini-park, as well as the UA women’s locker room. She has chaired the Wildcat Fundraising Committee and has personally sponsored many events for the UA football, baseball, softball, ice hockey, and men’s and women’s golf and basketball teams. Dorothy is an unending source of leadership, devotion, and unselfish dedication.